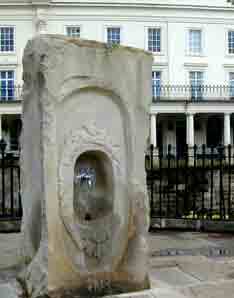 In July 1814 'The Royal Pump Room and Baths', designed and built by C.S. Smith of Warwick at a cost of £30,000 were officially opened. An orchestra played while visitors drank the waters. The Spa treatment was claimed to cure, or relieve a huge number of disorders, examples being 'stiffness of tendons', 'rigidity of the joints', 'the effects of gout and rheumatism and various paralytic conditions'. The Spa water is a mild laxative which is one reason why the water was drunk. By 1848 the fashion of 'taking the waters' had begun to decline. In 1996, Warwick District Council, in collaboration with Warwickshire County Council, produced proposals to relocate Leamington's Art Gallery, Museum and Library to the Pump Rooms. The scheme was further developed to include the refurbishment of the Assembly Room within the Pump Rooms and provision for a Tourist Information Centre and Café. The new building opened to the public in Summer 1999. The excellent new Museum has displays on the historic use of the Pump Rooms and Spa Treatments - including several weird and wonderful objects from the former physiotherapy department. There is still an opportunity to sample spa water from a tap overlooking the river (above), though it is unlikely to give you an appetite. The magnificent Turkish Bath suite (right) has been preserved within the museum, though there is no possibility of having a steamy experience any more. There is a stained glass window in Old Milverton Church, dedicated to the memory of Henry Jephson, MD (1798-1878) who ran a lucrative medical practice as a spa therapist and dietician. from 11am - 3pm every Monday except Bank Holidays. At other times and for group visits phone 024 76865540. Visits from schools are welcome. Workshops relating to the National Curriculum can be arranged with teachers. Guided Tours are available for pre-booked groups. Catering can also be arranged when the tea bar is closed. Halls Croft. 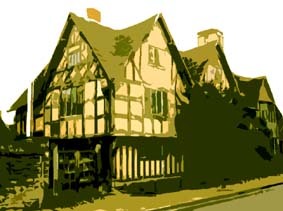 A fine half timbered house which was once the home of Dr John Hall, a Stratford physician who married William Shakespeare's daughter, Susannah. It now belongs to the Shakespeare Birthplace Trust who have furnished it in the mode of an early Jacobean doctor's house complete with a ''dispensary'' which looks uncharacteristically sanitised and tidy, though it does feature some attractive drug jars and arborelli. There is a small display in an upstairs room relating to medical practice in Shakespeare's time. Of particular interest is a map showing the extent of Dr Hall's practice. A provident dispensary was opened here by the parish surgeon, Henry Lilley Smith (1787-1859), in 1818. The site is commemorated by a memorial urn resting on a granite pedestal. Smith also established an eye and ear infirmary in 1823. 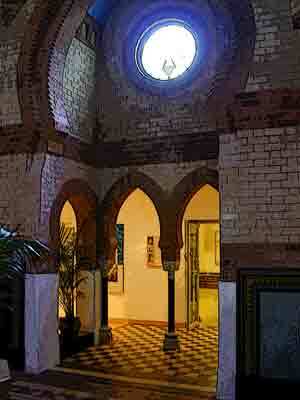 The building, fashioned in gothic revival style, now accommodates the Stoneythorpe Hotel. Southam has a long tradition of ophthalmic treatment as it has an ancient holy well with the reputation of curing eye ailments.